Biking through New York on a Citibike is one of my favorite things to do. And because the number of Citibike stations and bikes is rapidly growing, I'm not so much in a sweat anymore about the 30 minute time limit. There are some 750 stations throughout Manhattan, Brooklyn, Queens and Jersey. During my last trip I used the Citibike to bike from Williamsburg to Bushwick for the streetart tour. Something went wrong with returning it to a station because 4 hours later - when I was back on wifi - I saw a message from Citibike in my mailbox: "Looks like you've had that Citibike out for a while". Oops. This was going to be an expensive day out. You get a Citibike daypass for $12 or a 3-day pass for $24 which allows you unlimited 30 minute rides, but you pay $4 for each 15 minutes overtime. Luckily the lady at the Citibike Customer Service was able to trace that I had docked my bike and no extra costs were charged. I bought a 3-day pass and used it quite well. I went Citibiking to Madame Butterfly at the Metropolitan Opera. Dressed in a skirt and on sneakers, with my heels in a bag. The ride from the Moxy Hotel to Lincoln Center only took me 19 minutes. I saw that later in "my trips" on the Citibike app, which I had downloaded to sign up. The app works pretty good. It shows you (offline) where the nearest Citibike station is. 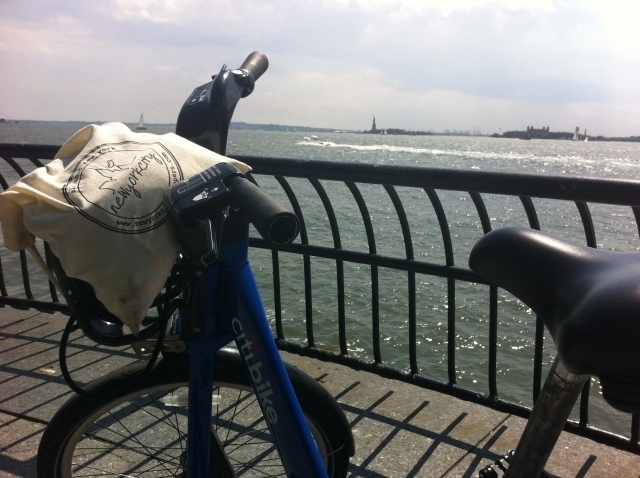 I also biked along the Hudson and past Chelsea Piers. Combined it with a stroll across the Highline and said hi-and-bye to the Jane. Got back on the bike and took it through Battery Park. I stopped at Liberty Street/Broadway where I treated myself to a fruit/vegetable shake. Stopped by the Oculus en the 09/11 memorial and well … seeing that I was in the neighborhood I whizzed through Century21(succesfully!). The Citibike website offers some nice routes. Find them here. Would you rather bike through New York City with a guide? We tried and tested Bike the Big Apple a number of times and really like them. Follow this link to find out more about them. The most recent tour I took with them went through Central Park and Harlem and included a gospelchoir performance. Very cool. Buy a daypass or a 3-day pass. 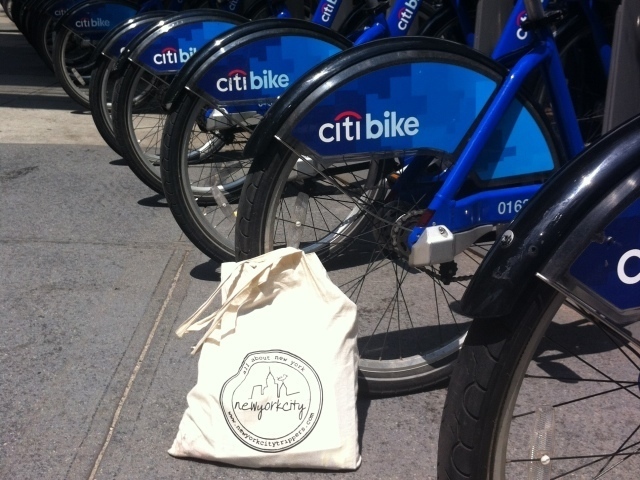 Get the Citibike app to sign up or get it at one of the Citibike stations. At the Citbike station find a bike that is ready to go and has the saddle at the right height. Or at least make sure the saddle has the right height before you undock it. That way you avoid unnecessary spending "precious New York Citibike minutes". 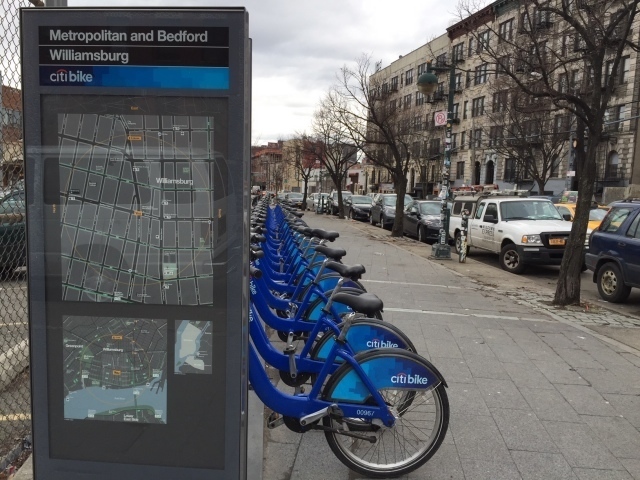 Check which route you are going to take and where the nearest Citibike stations are at. Good to know; if there are no available docks you can get a code for an extra 15 minutes at the kiosk at the end of each station. Make sure the light turns green when docking your bike. Only then your bike is properly locked and no extra costs are charged. Do you want to know how to get a Citibike? Watch the video I made. Enjoy!